Just in case there is any doubt that the operator had very little time to see the stopped train, we go back to the wonder of Google Street View (since I am too lazy to go there myself and take a picture). 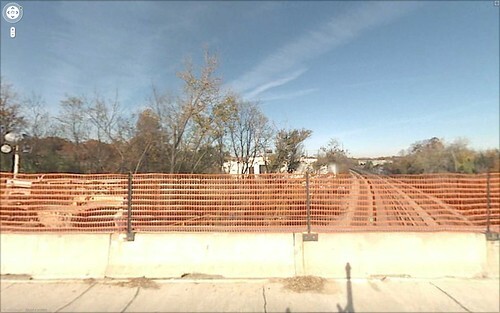 The picture below is standing on the bridge on New Hampshire Avenue looking north. The stopped train was actually a couple hundred feet south of here. We are looking north, while the train operator would have been looking from the north towards us. But obviously, if we can't see around the corner to the north, then she could not see around the corner to the south. You can click the photo to see a larger version. Finally, here is another version of the same overhead view showing lines of sight from further back, to the spot where the other train was stopped. The lines pass through buildings and trees. There is no way the operator could have had more than about 500 feet to see the stopped train. The building on the left from the street view is the closest building to the bridge here, barely 200 feet. The building on the right from the first image is the large building near where the train is photographed in the satellite image. It is about 400 feet from the bridge. This is basically the limit of visibility. But the operator would have not even have been able to see the train from there - the train was stopped 200 feet further south of the bridge, further around the corner and also obstructed by the bridge itself. Well, if Metro wasn't interested in killing their customers, they'd've chopped down the trees and torn down the buildings. Or alternatively, design some software that isn't so simple that it is perfectly content with the idea that a train might vanish, just because of some malfunctioning sensors. Boggles my mind. It shouldn't matter if every sensor in the whole system failed simultaneously. If a train is at point A, moving at X miles per hour, and fails to arrive at point B in a certiain time, FREAK THE HELL OUT!! No, instead, apparently, it just continues on its merry way, content that train A just vanished from thin air. Really. This is not rocket science. There is no reason whatsoever why the system shouldn't be smart enough to prevent a crash even in the event of catastrophic failure of the sensor relays. I suggest you write to Jim Graham about the software issue. He is demanding that all 4000 switches be replaced. While that may be appropriate, smarter software provides an additional fail-safe which should be a higher priority. Also, it's a lot cheaper.